Jameson Irish whiskey, has today announced the release of Jameson Wild Seaweed Bitters, launched to inspire mixologists around the world with an authentic taste of the Irish coastline. Jameson Wild Seaweed Bitters (46% ABV) is a highly concentrated infusion of Jameson Irish whiskey, along with a variety of herbs including: cinchona, wormwood, ginseng, gentian and wild dillisk seaweed. 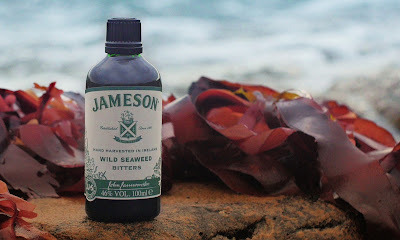 Said to be a true celebration of Irish ingredients, Jameson Wild Seaweed Bitters showcases wild dillisk seaweed, which has been carefully hand-harvested from Long Rock, County Sligo, and dried naturally on the shores of the Wild Atlantic Way by Damian Melvin, a second-generation seaweed harvester. Developed by Dave Quinn, Master of Whiskey Science at Midleton Distillery, Jameson Wild Seaweed Bitters, is a rich, intense and well-balanced bitters, that invokes the aromas and flavours of the rugged Irish seashore. This is the second release in the Jameson Bitters range, which was first launched with Jameson Wild Sloe Berry Bitters in 2015, to inspire bartenders to experiment with Jameson in new and exciting ways. Jameson Wild Seaweed Bitters, will be available next month from Jameson Distillery Bow St. in Dublin, the Jameson Distillery in Midleton and online via jamesonwhiskey.com RRP (tbc).